Neuhoff Media Springfield hosted the 21stAnnual Winterfreeze Regional Chili Cookoff on January 20th, 2019, at the KC 364 in Springfield. 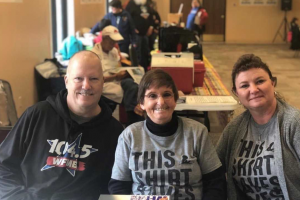 The annual event is held in conjunction with the International Chili Society and is a major fundraiser toward the St. Jude Cares for Kids Radiothon held in February. Donations were taken at the door and included live music, NFL playoff games in the adjacent Casey’s Pub and an afternoon of chili. The Homestyle Category was new this year, along with the traditional Verde and Traditional Red categories. The 31stAnnual St. Jude Cares for Kids Radiothon will be held February 21-22 on Neuhoff Media Springfield stations, WFMB-FM and WXAJ-FM, and Neuhoff Media Decatur’s 95Q.